I have photos stored on Facebook. I have spreadsheets stored in Google Docs. I have documents stored in Box. And I have videos stored on YouTube. Which is great--until I want access to these files when I'm offline. I could go to each site and download all of my files until I've amassed an offline collection of my stuff. Or I could just turn to SocialFolders, a service that offers an idea that's so simple--it syncs the content you have on your social sites to your desktop--I have to wonder why someone didn't think of it before. 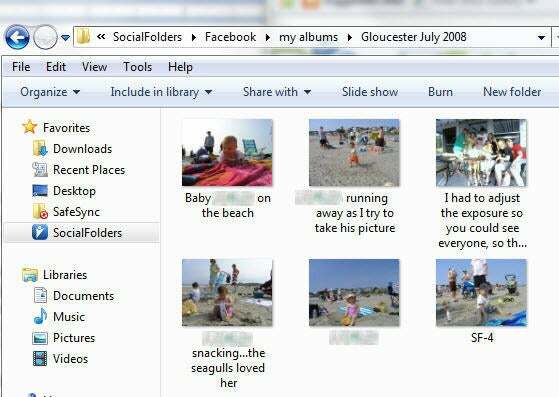 SocialFolders organizes your Facebook photos into folders that correspond with your album names, and photo titles that correspond to your captions. Once you've connected SocialFolders to your social services, icons for each of them will appear in the SocialFolders folder that's been created on your computer. Subfolders for each of your connected services will automatically be created there, too. You can use SocialFolders's Web interface to determine how much information you'd like access to (all of your Facebook albums, or only a select few, for example), and the content you've chosen will be automatically downloaded to your desktop. You will need to make sure you have the storage to spare, though, as some of these files could takeup plenty of disk space. SocialFolders is not only limited to downloads: It lets you upload files to your social sites, too. You simply create a folder in the SocialFolders directory on your desktop, and its contents will be automatically synced to your account. SocialFolders does more than just create a backup of your files. It also lets you access your friends' photos and files (as long as their privacy settings allow you to do so), and to create an offline copy of these documents, too. I found this a very handy way to grab photos of my nieces and nephews that my siblings share on Facebook. I did notice that some of the photos that SocialFolders downloaded for me looked to be slightly lower res than they appeared when viewed on Facebook, though. The company says that it does not change the resolution of photos when they're downloaded, but that it relies on the API of the social site itself. For example, SocialFolders uses Facebook's default upload API, which can reduce photo resolution. The company does note that most of the photo-sharing sites it supports lets users download photos in full resolution, though. Minor issue with photo resolution aside, I was quite impressed with SocialFolders. It offers a free and easy way to make sure you always have a backup of your precious online data. SocialFolders makes it easy to create offline copies of your online data.